Are any of the following surnames on your family tree: Corlett, Woolfall, Dumbell, Boulton, Aspinall, Hellam/Helme, Hulme, or Atherton from Lancashire; Grieve, Paterson, or Brydon/Bryden from the Scottish borders; Coulthard or Hetherington from Cumberland; Beer, Back, Sambell, or Little from Devon or Cornwall, Griffith, Hughes, Jones, or Thomas from North Wales? If so, you may be related to this Genealogy Junkie. My ancestors are all from the UK, mostly from England, but also from Wales, Scotland, and the Isle of Man. 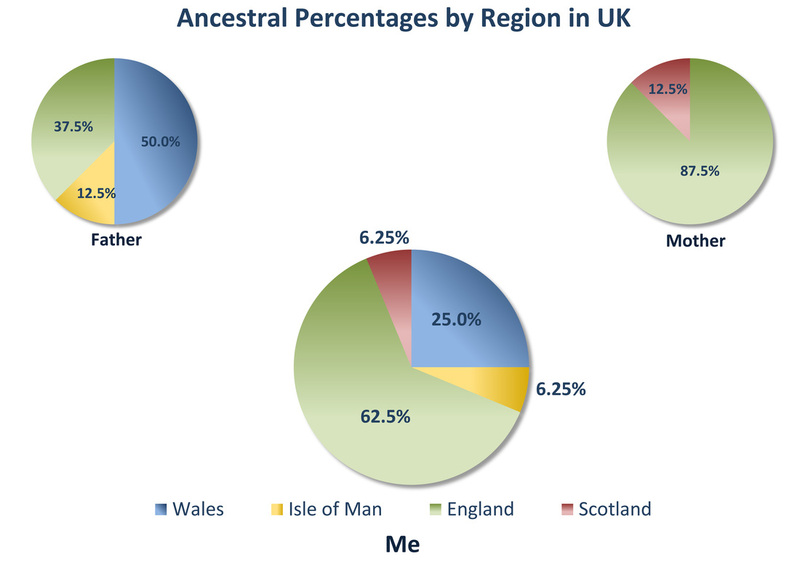 My ancestral percentages and those for my parents are illustrated in these Ancestral Pie Charts (link goes to blog posting, which provides the source for these). See Names and Places for lists of surnames and locations (to check if any of mine match yours), and My Pedigree Charts, to see how I may be related to you. I really love finding a signature of one of my ancestors, although many of the more distant ones couldn't write, so they signed with an "X" and "his or her mark" and their name was written in by someone else. In the absence of having a photo or a drawing of the person, a signature is the next best thing (although maybe chromosome mapping of DNA has become even more important to me) and I crop signatures whenever I find them in documents. The signatures above and in the blog posting for the Boulton Family are from a few of my ancestors, the oldest of which is from my 5th great-grandfather, John Braithwaite (1745-1817), on the Marriage Bond he signed shortly before his 1768 marriage to Agnes Briggs (1746-1770) in Dalton-in-Furness, Lancashire. Apologies for errors or outdated material on any of the webpages or blog postings. Let Me Know if you notice anything and I will correct or remove.